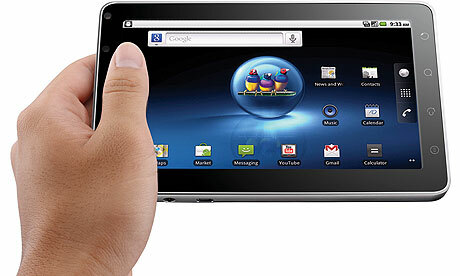 Home Gadget Reviews ViewSonic Viewpad 7 only PhP 19,990 at PCWORX! ViewSonic Viewpad 7 only PhP 19,990 at PCWORX! PCWORX now offers ViewSonic Viewpad 7 tablet another android tablet with respective ergonomic style , versatile and smart features. Viewpad 7 operates with Android 2.2 , 802.11b/g network, bluetooth, and 3G ready. Memory is expandable up to 32 GB with MicroSD with built in G-sensor, accelerometer, and ambient light sensor. Viewpad 7 has it’s 7 inches Capacitive multi-touch LCD screen with 800x480 resolution that let’s you enjoy eBooks, videos, photos, games, entertainment on-the go and can directly access to Google Marketplace to choose more than 200,000 apps and games. Viewpad 7 also enhanced productivity with your daily Document task like MS Word, Excel, Powerpoint and PDF.Plus, it supports Android Google Mobile Service Apps (GMS) for the easy access to Gmail, YouTube, Voice Search & more.